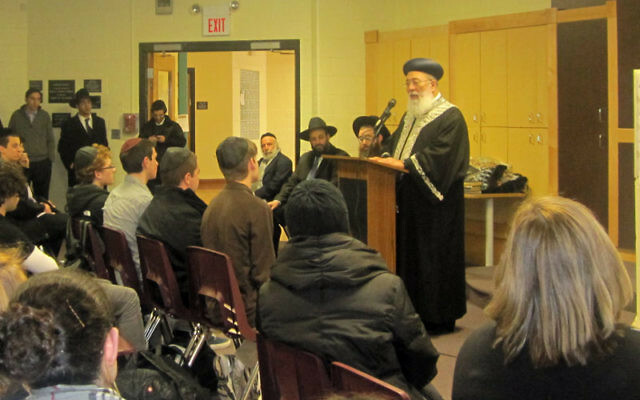 A school official said students and teachers were “impressed by the presence and spirituality” of Rabbi Shlomo Amar as he spoke to them. 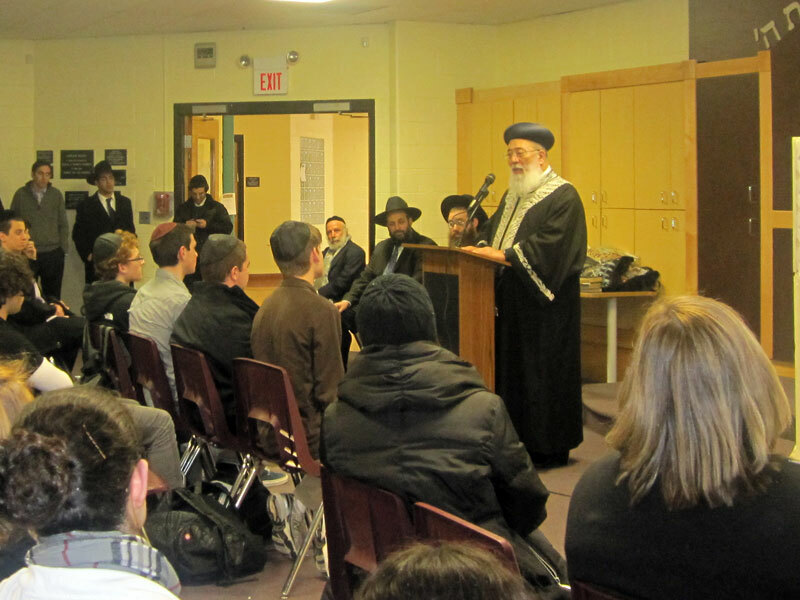 Students at Hillel Yeshiva in Ocean put on their Shabbat best on March 10 and welcomed with songs and blessings a very special visitor — the Sephardi chief rabbi of Israel. Rabbi Shlomo Moshe Amar was on a visit to the United States and visited most of the Syrian yeshivot in the Deal area and Brooklyn. Amar was born in Casablanca, Morocco, and immigrated to Israel in 1962 at the age of 14. Before his appointment as Sephardi chief rabbi in 2003, he served as head of the Petah Tikva Rabbinical Court, and in 2002 was appointed the chief rabbi of Tel Aviv. Students in the first grade welcomed Amar with traditional songs, as the fifth- and sixth-grade boys assembled to greet the rabbi as he entered the school. They escorted him to the auditorium where youngsters in grades two-eight were assembled. Under the direction of Rabbi Yosef Maslaton, the students greeted their guest with the chanting of pizmonim, or traditional melodies. Rabbi Amar recited a bracha on all those gathered and expressed his pleasure at visiting the students of Hillel Yeshiva, who, he said, were blessed to learn in the traditions of past generations. He thanked the school and its teachers for enabling the children to embrace and maintain those traditions. He continued by saying, “HaShem loves when we learn Torah, He loves our prayers, and He loves each and every Jew.” He urged the children to continue to learn Torah, to have “yirat shamayim and midot tovot” — to revere God and embrace good qualities. Amar went on to the high school, where he addressed the students in Hebrew. He told them he was happy to see so many of them observing the Torah and explained that “keeping close the words of the hachamim [wise scholars] keeps all of us on a straight path.” He blessed the students and recited a prayer together with them for the safety of am Yisrael. As the chief rabbi exited the building, the song “Yamim al Y’mei Melech Tosif” was heard playing throughout the halls. The next morning, Katz said, “the impact of Rabbi Amar’s visit was evident by the way the students recited their morning prayers,” with added fervency.